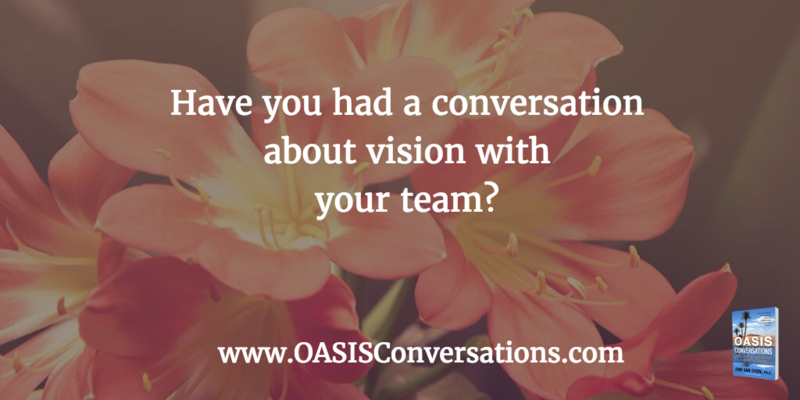 What is the Cost of Not Having a Vision Conversation? One of the most important investments you can make in yourself and your team is to clarify your personal vision and that of your team or organization. I have supported many teams with this process. It takes some effort to become aligned but the shared vision supports decision-making and also saves energy by averting conflicts that arise from misalignment. I recall one of my first roles working in an organization. All the members of the division had a different vision for the organization. There were many conflicts as a result–so much wasted energy and a lack of productivity. People were literally initiating projects that were serving different goals. Sometime people are focused solely on profit as their only goal. However, research reported by Harvard Business Analytics declares, “Those companies able to harness the power of purpose to drive performance and profitability enjoy a distinct competitive advantage.” In fact, the most profitable companies are not those most focused on profit. This is not a new finding. Collins and Porras reported in the book, “Built to Last” in 1994 that companies with a guiding purpose returned six times more to shareholders than comparative organizations that were primarily driven by profits. In addition, the World Economic Forum found that businesses that have a clear purpose-driven focus outperform those who do not 14 to 1. So there is much compelling research to support the power of a vision in driving outcomes. There are many other benefits too. There is more engagement, alignment and fun as people work collectively toward a meaningful future. A key component of a leader is to encourage people to work toward a shared vision and to communicate frequently to support mission or goal alignment and achievement. Ideally, individual visions are aligned with organizational visions in order to realize potential. To create alignment and a shared vision, leaders need to promote mind opening conversations. Team members need to feel heard and need to share empathy in order to create a compelling vision that can drive choices and behavior. Leaders with the skills to foster such conversations quickly experience the benefits. I worked with an organization where each of the leaders was creating programs and materials for the field members. Without a shared vision, there was overlap and confusion that led to polarization between the field and the headquarters. After open conversation with the team, they developed a shared vision and were able to save millions of dollars and serve the field offices in a cohesive way and ultimately gain market share with their clients. What is your personal vision and your team or organization’s vision? What is your vision for your community and our society? What can you do to support dialogue to create a shared vision? I would love to hear your vision and views on having conversations to create shared visions.